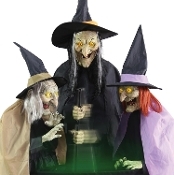 Watch this Lively TRIO OF SISTER CRONES cackling over their eerily lighted bubbling cauldron as they cast their spells! Scare away those troublesome neighborhood kids with our 5-Ft Tall Stitch Witch Sisters! With the tallest wicked witch standing at 5 feet tall, even the peskiest house guest will cower in fear. With manic, glowing eyes and a variety of cackle worthy sayings, these witches will become your Halloween staple for years to come. Three toiling trouble witches stirring cautiously while huddled around a large cauldron. You can hear the poisonous potion bubbling and brewing in the spooky green glowing pot! The larger middle witch stirs the cauldron, making clever comments while all cackle in their shrill voices. Their eyes light up and the two shorter sisters add their own magic touches with green glowing light beams emitting from their hands. Great addition to your next haunted scene! Choose from Steady-On, Infra-Red Sensor, or *Step-Here Pad (*YES, Included) activation options to operate. Simply plug into any 110v outlet. Assembly is required. Approximately 5 feet tall, 4 feet wide, 3 feet deep. Easy assembly with quick-connect poles.